C1461. BRUNO MADERNA Cond. Philadelphia Orch., w. VLADIMIR ASHKENAZY (Pf. 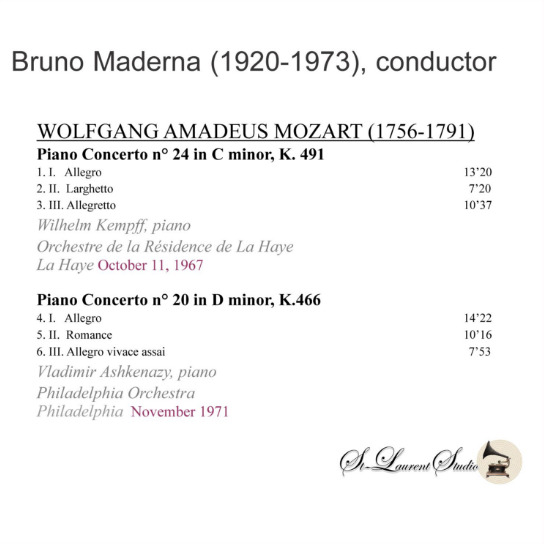 ): Piano Concerto #20 in d, K.466, Live Performance, 1971; BRUNO MADERNA Cond. L’Orchestre Résidence de la Haye, w. WILHELM KEMPFF (Pf. 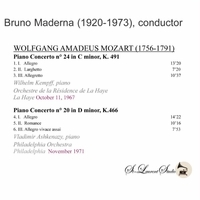 ): Piano Concerto #24 in c, K.491, Live Performance, 11 Oct., 1967 (both Mozart). (Canada) St Laurent Studio YSL T-375. Transfers by Yves St Laurent. 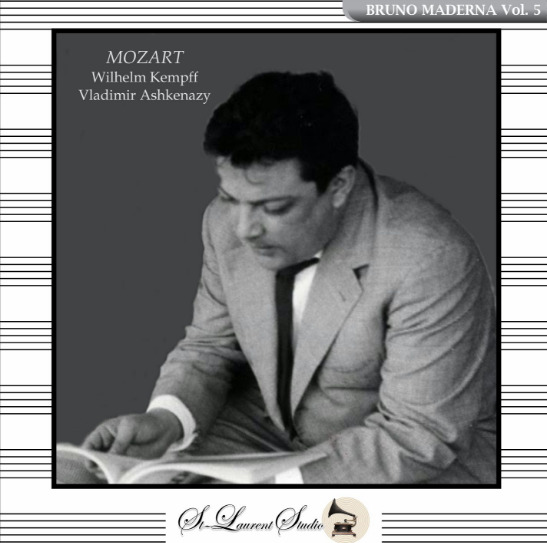 “Wilhelm Kempff played to Busoni, heard Eugen d’Albert (one of Liszt’s greatest pupils), and his own teacher, Heinrich Barth, and had been a prize pupil of Hans von Bülow, Liszt’s son-in-law. Kempff wrote about d’Albert and Busoni in detail in his autobiography. These two great pianists, both of whom transcribed Bach’s organ chorale preludes for solo piano, were important musical influences for Kempff. Eugen d’Albert was the first pianist about whom Kempff wrote in his autobiography. During the next decades Mr. Kempff made concert tours of Germany, Scandinavia, South America and Japan. He rode on the Graf Zeppelin to Buenos Aires in 1934 for a tour; the dirigible received extensive press coverage and was met by a crowd estimated in the millions. Kempff’s debut in England was 17 June, 1935 at the Aeolian Hall in London performing a recital with the violinist Cecilia Hansen. During World War II, he performed mostly in Germany and occupied countries by the Germans. He returned to the Paris concert stage 22 November, 1948 and to London 27 October, 1951 at Wigmore Hall. His American debut happened during the later years of his life when he gave a recital in Carnegie Hall 15 October, 1964.